Optimai Personal Account Dealing Solution mitigates reputation risk due to front running of trades, and improves compliance workflow. It performs pre-trade check of employees' personal investment activities against laws, regulations and conflict of interests, and supports regulatory declarations. This is an easy-to-adopt solution. During implementation, FMCs may configure their compliance rules such as restricted security, pre-trade blackout period, minimum holding period, as well as the approval process flow according to compliance policies. And the solution is easy-to-use. Employees may submit pre-trade requests electronically. 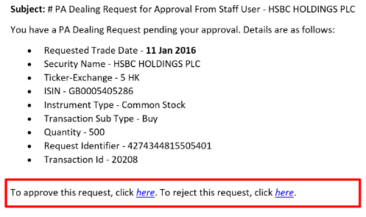 The system then automatically checks these trade requests against pre-configured compliance rules, and generate a rejection email if there is a breach. Pre-trade requests that clear the system checks will be routed to approvers via email. Approvers may review the trade details on the email on their mobile devices or computers; and approve/reject the trade directly. Employees may check the status of their trade requests on the system, as well as update contract notes after the trade. The system also automatically sends reminder emails to employees to file their declarations, at a frequency that is pre-determined by Compliance. 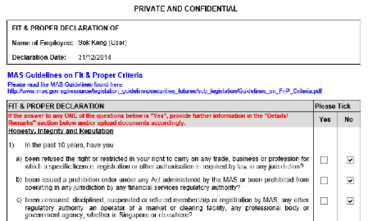 Our customers use this solution to comply with Securities and Exchange Commission (SEC) and Monetary Authority of Singapore (MAS) personal account dealing policies and declarations.